Expansion for Flick 'em Up! In this new expansion for Flick’em Up!, the infamous Cooper clan has begun taking over small villages. Those villages, however, belong to the Native Americans, who are armed with bows and tomahawks, and ready to defend their land in 5 exciting scenarios. But they best be careful around the Cooper clan’s new weapon : the relentless Gatling gun. 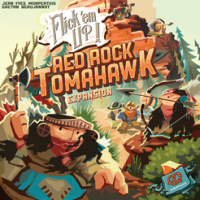 Add a Review for "Flick ’em Up: Red Rock Tomahawk"